Young German director Claus Guth has polarized audiences like few others, with previous works such as the Salzburg stagings of Nozze di Figaro and Don Giovanni as well as his Zurich Ariadne auf Naxos. Now he is in charge of the 2008-10 Nibelungen Ring at the Hamburgische Staatsoper conducted by Simone Young, of which this Walküre is the second installment after last season´s Rheingold. Claus Guth´s concept as it appears in this Walküre is not new, but it is executed with more consequence and clarity than I have seen before. Claus Guth certainly is no man of the middle-road, which his previous work testifies to as well. Die Walküre is simply Wotan´s marionette theater, in which he orchestrates and controls every single movement. Act one opens during the prelude to a reclining white platform with a red button on the side on which the white-clad Siegmund and Sieglinde stand in frozen positions until “activated” by Wotan. As we learn in Act two (se photographs below), this is in fact a miniature world, an electric marionette theater placed on Wotan´s table in “real life”. The spotlight blinding Siegmund and Sieglinde during “Winterstürme” is placed in Wotan´s “real life” living room and Wotan conveniently appears mid-Act 1 to place the sword in the entrance/exit miniature door. That Wotan in the “real world” takes the miniature Hunding and places him on the real floor (from where Fricka subsequently picks him up) is part of the marionette game as everything else. The side wall of Wotan´s room is decorated with a disc of the world surface. On the floor we see a two-storey doll-house with Wotan´s marionette Valkyries, the miniature world we are to step into in Act 3 as it turns out. When Brünnhilde announces Siegmund´s death we are once again in the miniature world, now underneath the electric marionette game. And in Act three we have moved into Wotan´s miniature doll-house of Act two – the floor between the basement and first floor has been blown away and the Valkyries are now trapped in the basement, trying in vain to move to the upper level. In the end, this basement is where Brünnhilde is put to sleep. 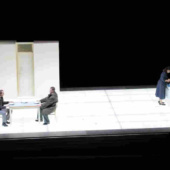 There is much to admire in Claus Guth´s staging and the concept resonates well with many aspects of the work. However, I suspect Die Walküre will ultimately turn out the weakest installment of his Ring, for the simple reason, that it is the singular part of the tetralogy least suited to abstract ideas. Essentially a chamber drama, to lift it off, interpersonal drama is needed. And this we do not get here, whether entirely attributable to Guth is difficult to say. However, to have Siegmund and Sieglinde as well as Wotan and Brünnhilde virtually non-interact/interact with stylized gestures clearly carries Claus Guth´s trademark. However, if he succeeds in creating a convincing beginning in Rheingold as well as tying the ends together in Götterdämmerung, this may be a small price to pay. Together with David McVicar´s Strasbourg production and Fura del Baus´ Valencia showing, this looks like the outlines of one of the most interesting Rings on the circuit. Vocally, the absolute highlight of the evening was Yvonne Naef´s wonderfully dark and very moving Sieglinde. Even the third act “O hehrste wonne” she navigated rather well, though obviously the price to pay for a mezzo-soprano Sieglinde is the power in the high register. Falk Struckmann is what I would call Regie-resistent if I was writing in German (though perhaps strictly speaking not a correct German word, I trust most will get my point): He simply always plays himself. Last month it was Pizarro, before that Duke Bluebeard. A previous Bayreuth Wotan (also on DVD from Barcelona) and a mainstay of countless Barenboim Wagner productions at the Berlin State Opera in the past 15 years, his Wotan is a known entity. Though closer to a character baritone these days, he was in better voice than I have him in for a long time – especially the depths of the monologue he navigated rather well with a surprisingly smooth legato, however he almost retorts to yelling out the topnotes and generally sings in a way which does not sound healthy. He does, however, generates a fair amount of authority, but only when he moves around… However, this is not news. Interpretatively, though, the water is rather shallow: Falk Struckmann´s Wotan is no different a character than his Iago, Amfortas, Kurwenal etc: A semi-detached person who glides on the surface – not entirely unsuitable for Guth´s concept, I suppose..
An equally known entity from Berlin and Bayreuth is Deborah Polaski´s Brünnhilde, also she past her prime, but nevertheless remaining one of the finest Brünnhilde´s around, with an impressive middle to lower register. Futhermore she is on pitch with a tolerable vibrato. That her acting skills are less than engaging is not news to those familiar with her, however she is no worse than most and looks the part reasonably, even at 59. Less understandable is the casting of Jeanne Piland as Fricka in a part at least 30 mezzo-sopranos on the circuit (as well as several company members) could have done better-to-vastly-better. And if Claus Guth intended Hunding to be menacing (perhaps he didn´t), young second-rate-mobster-looking Mikhail Petrenko is simply not the man, despite fine singing. Stuart Skelton´s Siegmund most of all looks like a passive hip-hopper – loose clothing, almost no presence on stage and a voice in the lighter end of the spectrum, though not at all uneffective. 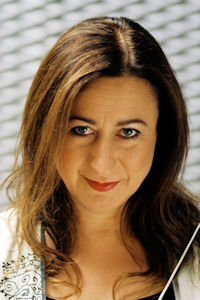 Also Simone Young previously conducted the Barenboim Ring (in his absence, obviously) at the Berlin State Opera, and interpretatively I find much to like: She is wonderfully dynamic and rather brisk in a reading emphasizing the lower strings and with plenty of rubato to a degree that occasionally the inner-flow seems missing. But in summary she conducts a Walküre with much glow and she is never boring. She states her major influences to be Barenboim and Furtwängler. I hear a lot of both in her interpretation, but she certainly has her own ideas as well. All in all, a very promising Hamburg Ring. There is a valid argument to the Bayreuth tradition of staging a new production of the Ring in its entirety and then refining it over a period of years. I myself however, get great enjoyment in other opera houses watching a new Ring develop over a longer stretch of time, opera by opera, until a Cycle is complete – or the project abandoned, as it has been on at least four occasions in my experience. I hope that that never been down to anything I have written because although I say this rather tongue-in-cheek, it is certainly true that I was once berated by a Wagner authority for the part I apparently played in driving an esteemed British Wagner director to seek work mainly abroad. Unbelievable perhaps, but genuine thoughI can’t think any critic in any form has that power these days. Certainly not me. I came to Hamburg for the second instalment in the new Ring Cycle by director Claus Guth who has already in his short career staged Der fliegende Holländer at Bayreuth. In March I reported on Das Rheingold (See Review) and felt a underwhelmed and wary of directorial heavy-handedness. The action was played-out in a doll’s house with Wotan as the director of an expressionist film. As the curtain rises for Die Walküre , the sets and costumes by Christian Schmidt make very few references to Das Rheingold and time has clearly moved on. Later the large circular set for Rheingold – Wotan’s attic, as I described it – becomes a model set up by one wall of Wotan’s plush stylish new office. There are some other model sets scattered around to show that Wotan has come along way from his earlier home movies and is now in the big league. Quite where this concept is going remains unclear but perhaps the programme makes two long references to ‘The Truman Show’ – Jim Carrey 1998 film in which he played Truman Burbank whose life is a fake one. The place where Burbank lives is actually a big studio and there are cameras everywhere. His wife, friends and everyone around him are all actors playing out their roles in the world’s most popular TV-series ‘The Truman Show’. Burbank believes he is an ordinary guy with an ordinary life but he is being exploited for the consumers of ‘fly on the wall’ TV until the day he finds out the truth. Siegfried as Truman Burbank then? Only time will tell? 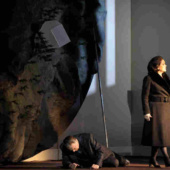 Act I takes place on a large version of the illuminated panel that Wotan has in his office in the next Act, in which he has a cardboard cut out of the set and model characters to manipulate. Everything is white, there is an entrance and doorway, a table, two chairs and a stool and a small cooking area. Sieglinde is in dowdy plain blue, Siegmund is a hoodie and Hunding wears black leather. Wotan, spear in hand, strides across the front of the stage and clicks his fingers to start the action. As previously described, Act II takes place in Wotan’s office complete with large shuttered windows and a radiator. The room is dominated by the set of Wotan’s ‘world’ near to one wall and there is another table and more chairs. These chairs gave me my only real moment of ‘directoritis’ in this otherwise compelling evening as it was obvious from the outset that they would be thrown around when Wotan becomes angry whilst explaining his plight to Brünnhilde. … They were. The rest of Act II takes place below the large panel that seen in the first Act. Both Wotan and Fricka are expensively dressed and Brünnhilde’s costume appeared to be partly safari suit and army fatigues. Act III probably will make more sense when Claus Guth’s entire concept for the whole Ring Cycle become available. Initial thoughts were of a bombed out and distressed orphanage with the pasty-faced Valkyries are incarcerated and to which the only means of access is an upper level doorway and a ladder. There are washbasins stage-left and some mirrors –which may allow the Valkyries to be spied on in the manner familiar to devotees of ‘The Truman Show’ or the TV-series ‘Lost’. This Walküre had already suffered one casualty when the promised Brünnhilde, Lisa Gasteen, cancelled her performances through illness. 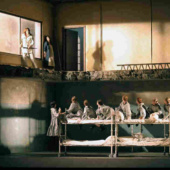 Then on the first night, Falk Struckmann apparently lost his voice and although he performed the role on stage, his music was sung from the pit by Thomas J Mayer, a member of the Hamburg State Opera ensemble. For the second night, described as Première B, in a charming apology prior to the performance, a spokesman announced there would be another ‘variation’ and that Mayer would not only sing Wotan but would act the role too, although he would be unable to offer the complete performance that the director originally intended. As a replacement, Mayer was not a totally unknown quantity as he had recently sung the role in Karlsruhe. Highly experienced, he was preparing the four villains in Les Contes d’Hoffmann in early November at Hamburg as well as standing by for Wotan. Quite simply however, his was the finest Die Walküre since … well I cannot really remember many better. He possesses a bass-baritonal voice that is smooth and effortless from bottom to top, clear diction and great dramatic skills. With long-hair and beard he resembled a young John Tomlinson both in character and vocal attack but even Tomlinson, as wonderful a Wotan as he is, even in his early days, never sung the role with Mayer’s apparent ease. As Brünnhilde we had the rare privilege of hearing once again the incomparable Deborah Polaski. I have to remark that she will soon be entering her seventh decade and that fact alone made her lively athletic and tomboyish Valkyrie all the more remarkable. In Act II she ‘Hojotoho’-ed clambering through a large window and in Act III she went up and down a rickety ladder a number of times, stopping at least once to sing as she did so. Her voice shows little wear and tear and is still bright at the top and well by her characteristically warm chest register. Her ‘War es so schmälich’ was emotionally draining and her ‘Du zeugtest ein edles Geschlecht’ suitably conspiratorial. With Mayer’s joyful, yet heartfelt, ‘Leb’ wohl, du kühnes, herrliches Kind!’ this made for a rapturous final scene which was not only the natural culmination of the entire evening but gave us heart-stopping moments for which the rest of the opera seemed merely the prelude.Finally Brünnhilde settled down on the floor, took her boots off and as Wotan evoked Loge real flames flickered to life to frame the sleeping Valkyrie. Mikhail Petrenko was a rather bland Hunding singing well but more eloquently than menacingly, Stuart Skelton was a lyrical, effortless Siegmund though his tone lacked baritonal warmth. He is not much of an actor either unfortunately and just often just seemed to stomp around the stage. The mezzo, Yvonne Naef was miscast as Sieglinde and her voice was often gratingly sharp. There was choppy, poorly supported, phrasing and her best moments were her final ecstatic outpouring of ‘O hehrstes Wunder!’ which was too little, too late, for me. Fricka is the role to which Naef’s voice is probably better suited but here the goddess of marriage was sung with great poise and restraint by Jeanne Piland. The Valkyries seemed well chosen and they enjoyed their pillow fights as part of some demanding choreography involving their bunkbeds. Of course their chatter about horses and heroes was just fantasy or delusion. Loth though I am to find any criticism in Simone Young’s reading of the score I felt that Act I and II were almost something to be got out of the way in order to arrive at her sublime Act III: and maybe she will give a more fully integrated performance at some time in the future. Yet right from the beginning with that ominous tread so obviously later adopted by Mahler, hers was a vigorous, far from a typically stodgy Germanic interpretation. There was no lack of gravity and there were many moments when she let the long lines of Wagner’s melody cast their spells. The Hamburg Philharmonic played well throughout even if the tone of the brass particularly, sounded a little unrelenting from my seat in the front stalls. Simone Young has a firm grasp of Wagnerian progression and there was much illuminating and imaginative detail throughout an engrossing evening. The conductor and her orchestra – who were all brought on stage at the end – thoroughly deserved the ovation they received. Siegfried cannot come along quickly enough for me. Die Kritiken der Premiere waren zumeist wenig schmeichelhaft. Vor allem auf der musikalischen Seite wurden Unsicherheiten und Unfertigkeiten attestiert. Und siehe da – ein Opernhaus kann lernen! Es wurde offensichtlich noch geprobt und gefeilt – und die Philharmoniker unter Simone Young legten (in der besuchten 5. Aufführung) eine gereifte, glänzende „Walküre“ hin, präzise im Kleinteiligen, zugleich mit weitem Schwung und in einem großen dramatischen Atem. Einzig in der Liebesszene im 1. Akt („Winterstürme“) knickte die musikalische Spannung ein wenig ein. Besonders packend aber waren die Zwischenspiele. Der Walkürenritt gelang federnd, fast swingend. Beeindruckend der Schluss mit dem Feuerzauber. Viel wurde also wieder gut gemacht nach den kräftigen Buhs zur Premiere. Simone Youngs Wagner-Zugriff erwies sich über weite Strecken als wahrhaft atemberaubend. Aber auch die Inszenierung soll hier gegen ihre Kritiker verteidigt werden. Mit einigem Understatement hatte Claus Guth im Vorfeld jeden Anspruch auf eine Konzeptinszenierung aus einem Guss von sich gewiesen, der Chéreausche Ring sei ohnehin der bisher Letztgültige. Seinen Inszenierungsansatz bezeichnete er als fragmentarisch. Man wird erst nach Abschluss der Tetralogie sehen können, wie dies zu beurteilen ist. Die „Walküre“ als einzelner Teil daraus aber ist in überaus stimmige und überzeugende Bilder übersetzt worden. Abgesehen von einigen wenigen Entbehrlichkeiten (etwa pantomimische Verdoppelungen der Zwillingsgeschwister als Kinder oder die Sargträger bei der Todesverkündigung) hat Claus Guth eine überaus klare und erhellende Bildsprache gefunden. Die prägnante Personenregie führt das szenische Geschehen aus dem Blickwinkel einer focussierten Kommunikation beeindruckend auf seinen psychologischen Kern zurück. Was etwa in den Dialogen Wotan- Fricka oder Brünnhilde – Wotan an unausgesprochenen Signalen zwischen den Figuren hin- und her geht, ist genauestens ausgefeilt. Es ist Wotans Welt, in der die gesamte Handlung spielt und es sind Wotans Geschöpfe, die als nur scheinbar selbstbestimmt Handelnde auftreten. Am Anfang knipst Wotan das Geschehen mit einem Fingerschnipp an und am Bühnenrand leuchtet die Studiolampe rot auf: das Experiment geht auf Sendung. Als derart determinierte Wesen bewegen sich Sieglinde, Siegmund und Hunding auf einer kleinen, weißen Fläche, ihrem Lebens-Spielfeld, wie aufgezogene Puppen in eingeschränkter Gestik. Die Bühne ist so sparsam möbliert, wie die Aktionen begrenzt sind. Wie in einem mechanischen Theater bewegen sich die Wände und Türen. Nur an wenigen Stellen scheinen die Figuren eigenes Leben zu entfalten wie beim Wiedererkennen der Geschwister oder im Moment des Verliebens. Stuart Skelton ist ein stimmlich strahlender Siegmund. Er verfügt über die selten gewordene Gabe des fein gebundenen Wagnergesangs, ohne das heldische Element nicht auch zum Leuchten bringen zu können. Yvonne Naef als Sieglinde kann besonders durch gesangliche Innigkeit überzeugen. Mikhail Petrenko stellt einen ausnehmend jugendlichen Hunding dar. Seine Stimme kann durchdringen, es fehlt ihr aber ein wenig die Schwärze und Härte für die Bosheit dieser Figur. Im 2. Akt sieht man dann Wotans Weltentwurf als große Scheibe an der Wand seines Büros hängen: Hundings Hütte scharf an einem Abgrund, dahinter etwas Wald, der Rest ist noch mit einer Plane abgedeckt; Raum für Phantasie und spätere Enthüllungen. Hier stehen auch die verkleinert konkreten Modelle von Wotans Machtplänen mit den dazu gehörigen Figuren darinnen. Fricka wird aus Protest gegen Wotans Kreaturen später Siegmunds Figurine zwischen ihren Fingern zerquetschen. Ihrem selbstbewussten Eigensinn ist der kalte Zynismus Wotans kaum gewachsen. Falk Struckmann spielt dessen tragischen Spagat zwischen Machtanspruch und Scheitern mit großer Präsenz höchst eindrücklich heraus. Auch stimmlich ist er die beherrschende Gestalt dieses Abends, ein großer Sängerdarsteller mit enorm wandlungsfähiger Stimme und mächtiger Ausstrahlung. Ihm ist es zu danken, dass die „Walküre“ auch wesentlich ein Wotan-Stück geworden ist. Jeanne Piland spielt seine Gattin eindrücklich und konsequent als seinen Gegenpol, stimmlich dringt sie allerdings an zu vielen Stellen nicht durch und lässt sich vom Orchester überdecken. Als dann Brünnhilde auftritt, wandelt sich Wotan zum liebenden Vater. Ihrem Dialog hat der Regisseur viel Aufmerksamkeit gewidmet und er entwickelt sich als seelischer Austausch zwischen Vater und Tochter, der sich im Schlussbild dann zu höchster Intensität steigert, wie sie ergreifender kaum sein kann. Als Brünnhilde entwickelt Deborah Polaski nicht allein ein packendes darstellerisches Portrait dieser Rolle, sondern kann auch, trotz leichten Druckes in extremen Höhen, die Stimme so flexibel einsetzen, dass diese Rollengestaltung auch gesanglich starke Ausdruckskraft und Beseeltheit gewinnt. Die Todesverkündigung gestaltet sie zu einem musikalischen Höhepunkt des Abends. Der dritte Akt spielt in einem heruntergekommenen Gebäude, in dessen unzugänglichem Tiefgeschoss die Walküren anscheinend wie Gefangene gehalten werden. Wild toben sie beim Walkürenritt umher, vor dem erscheinenden Wotan stieben sie in Panik auseinander. Diese Szene ist meisterhaft choreografiert und die acht Sängerinnen geben ein Musterbeispiel für exakten Ensemblegesang ab. Anrührend dann, wie Brünnhilde sich in diesem kargen Ambiente zur Ruhe bettet, Wotan liebevoll ihre Schuhe zusammenstellt und von der geliebten Tochter Abschied nimmt. Der Feuerzauber allerdings entfaltet nur musikalisch seine magische Wirkung, optisch fällt das Flackern der Flämmchen am Bühnenboden doch ein wenig zu klein aus. Das schmälert aber den insgesamt großen Eindruck dieser Szene nicht. Mit nur wenigen Abstrichen mit Fug und Recht ein beeindruckender Wagner-Abend! Wotans wilde Töchter toben als schlecht erzogene Rangen durchs Mobiliar, und der Regisseur erhebt den Zeigefinger: Claus Guth inszeniert Wagners „Walküre“ an der Hamburger Oper als Marionettenspiel – unentschlossen und plakativ. Gibt es über uns einen mächtigen Spieler, der die Menschen wie Figuren auf einem großen Schachbrett durchs Leben manövriert? Ein gleichermaßen faszinierender wie erschreckender Gedanke. Alle Freiheit des individuellen Willens wäre dann der Willkür einer höheren Instanz übertragen. In Claus Guths Hamburger Neudeutung von Wagners „Ring des Nibelungen“ erscheinen die Helden und Schurken der Tetralogie als lenkbare Puppen in einer großen Versuchsanordnung des Gottes Wotan, der die in Gut und Böse zerfallende Welt mit allerhand Tricks und Rochaden wieder zur Einheit zwingen will. Dass sein Experiment scheitern muss, steht außer Zweifel – ob es der Regie bei der Umsetzung dieses Konzepts im Ganzen besser ergehen wird, ist dagegen fraglich. Schon das „Rheingold“ hatte einen zwiespältigen Eindruck hinterlassen. Neben klugen und hintergründig durchdachten Einzelszenen zeigte die Inszenierung einen irritierenden Hang zur bloßen Bebilderung und verlor sich mitunter in einer Kleinteiligkeit, die auf einer großen Bühne wenig Wirkung entfalten kann. Guth und sein Ausstatter Christian Schmidt schafften so ungewollt ein radikales Gegenkonzept zur Vorgängerproduktion aus den frühen neunziger Jahren, wo Günter Krämer und Andreas Reinhardt in den besten Momenten Tableaus von elementarer, fast archaischer Kraft gelungen waren. Eine gewisse Scheu vor Klarheit und Unmittelbarkeit wird nun auch in Guths Lesart der „Walküre“ spürbar, die bei der Premiere lautstarke Kontroversen auslöste. Dabei beginnt der Abend überzeugend mit einem subtil als Kammerspiel inszenierten ersten Akt. Tisch und Stühle, eine Küchenzeile und eine – wenn auch allzu oft – von Götterhand durch den Raum bewegte Tür genügen als abstrakte Requisiten. Das Drama der Wälsungen ist Teil jenes Spiels, das der Herrscher über Walhall höchstselbst auf einem die ganze Bühne füllenden Leuchttisch ins Werk setzt. Dieser Leuchttisch zieht sich als optisches Leitmotiv durch die ersten beiden Akte, mal im verkleinerten, für Götter passgenauen Maßstab, mal bedrohlich überdimensioniert wie in der Menschensphäre, wo Siegmund und Sieglinde nach vollzogenem Inzest Gefahr laufen, von der numinosen Spieltechnik erschlagen zu werden. Leider belässt es Guth nicht bei diesem starken Einfall, sondern verfällt immer wieder in eine Art Zeigefinger-Dramaturgie, die unzähliges Zusatzpersonal – hier ein junges Zwillingspärchen, dort ein höhnendes Alberich-Double – über die Bühne schickt, auf dass ja keine Frage offenbleibe. Der Regieaktionismus verdoppelt jedoch oft bloß den Text und lenkt vom Eigentlichen ab. So wird die von Deborah Polaski als Brünnhilde sehr eindringlich gestaltete Todesverkündigung durch eine ungelenke Pantomime von acht gefallenen Walhall-Anwärtern empfindlich gestört. Einen Gegenakzent setzt der dritte Aufzug, der mit einem frech und provokant gegen den Strich gebürsteten Walkürenritt beginnt: Wotans Maiden sind bei Guth zu einer Schar vernachlässigter und komplexbeladener Kinder mutiert, die in einem Architektur gewordenen Albtraum hausen und in ungehemmter Regression eine Schlacht mit dem Mobiliar ihrer Erziehungsanstalt eröffnen. Mutige Amazonen für den Sieg über Alberich hat Wotan hier offenbar ausbilden wollen; doch das Projekt ist, wie so viele, gründlich gescheitert und hat nur eine Truppe gefühlloser Kampfmaschinen hervorgebracht. Nach diesem abgründigen Auftakt verläuft der Rest des Aktes wieder in konventionelleren Bahnen: sauberes Handwerk in der langen, seltsam autistisch wirkenden Auseinandersetzung zwischen Wotan und Brünnhilde, ein ungeschickt ins Halbdunkel verlegter Abschied, ein brav züngelnder Feuerzauber zum Abschluss. Zur unentschlossenen Regie kam eine ähnlich unausgewogene musikalische Deutung. Besonders die sängerischen Leistungen blieben deutlich hinter den Standards und Möglichkeiten der Staatsoper zurück. Den besten Eindruck hinterließ bezeichnenderweise ein Einspringer. Für Falk Struckmann, der wegen eines Infekts lediglich stumm auf der Bühne agieren konnte, sang der junge Bassbariton Thomas J. Mayer von der Seite, und er nutzte diese Chance, trotz gewaltiger Anspannung, in beeindruckender Weise: jederzeit souverän im Einsatz seiner durch nahezu alle Register sonor abgerundeten Stimme, vorbildlich in der dynamischen Abstufung und unermüdlich in der Suche nach immer neuen Nuancen der Textdeklamation. Neben diesem überragenden Debüt wirkte die ähnlich souveräne, aber mit Höhen- und Intonationsproblemen kämpfende Deborah Polaski deutlich routinierter. Erfahren und darstellerisch elegant die Fricka von Jeanne Piland, deren stimmliche Möglichkeiten allerdings in dem großen Haus an ihre Grenzen kamen – ein Vergleich mit der hier zur Legende gewordenen Hanna Schwarz verbot sich. An lange in Hamburg beheimatete Vorbilder wie Kurt Moll oder Matti Salminen durfte man auch bei dem allzu harmlosen, ungewöhnlich jung besetzten Hunding von Mikhail Petrenko nicht denken. Ein dichtes Porträt gelang dagegen Yvonne Naef als Sieglinde, obschon ihre Stimme im oberen Register immer wieder unschön ins Flackern geriet. Der Siegmund von Stuart Skelton schließlich kam trotz einer im Ganzen bewältigten Partie weder Wagners Ideal eines deutschen Belcanto mit entsprechender Legato-Kultur noch der eines überzeugenden Sängerdarstellers nahe. Den Unmut über diese unbefriedigende Besetzung bekam Simone Young schon in den Pausen zu spüren – gemeint war damit wohl mehr die Intendantin des Hauses als die Dirigentin. Denn die löste ihre Aufgabe mit einem straffen, sehr klangvollen, aber niemals süffigen Zugriff auf Wagners Musik durchaus untadelig. Ein wenig mehr Verfeinerung im zeitweise ungeschlacht dreinblasenden Blech wäre für die Zukunft zu wünschen. Auch musikalisch ist das Hamburger „Ring“-Spiel noch längst nicht gewonnen. Ring frei zur zweiten Runde: An der Hamburgischen Staatsoper hatte Wagners “Die Walküre” Premiere. Claus Guths Inszenierung ist wasserdicht – und beinahe durchgängig idiotensicher. Das Publikum murrt trotzdem. Kurz vor dem dritten Klingeln haut er ab. Bühnentür auf, zwei, drei scheue Blicke in die Gesichter derer, die gerade noch im Seitengang stehen – keiner erkennt ihn. Hoch die Treppe, ab durch den Ausgang. Oder doch in die Loge? Egal. Jetzt kann er ohnehin nichts mehr ausrichten, kann nur warten, fünf Stunden lang. Dann muss er auf die Bühne, im grauen Anzug, und sich seine Buhs abholen. Dass er die kriegt, ist jetzt schon sicher. Es wäre das erste Mal, dass er, Claus Guth, hier keine kriegte. Und Guth kriegte sie auch diesmal: bei der Premiere der “Walküre”, dem zweiten Teil des “Rings des Nibelungen”, in der Hamburgischen Staatsoper. Dabei hatte es der Regisseur des Hamburger “Ring”-Großprojekts seinem Publikum diesmal leicht gemacht: Was er servierte, war ganz und gar kein dicker Brocken. Sondern sehr leicht zu verdauen. Guth ließ die Finger davon, das Libretto so lange zu durchforsten, bis er einen unbeleuchteten Fleck gefunden hat, um dort seine Deutung zu verorten. Was er eigentlich gerne tut. In seiner “Walküre” zeigt Guth dagegen nur, was offensichtlich ist. Mit einer exzellenten und bis ins Detail ausgefeilten Personenregie. Und mit einer Vielzahl mehr oder weniger eleganter Querverweise – lieber einem zu viel als zu wenig. Keine Anspielung bleibt in der Luft hängen, alles wird illustriert, zu Ende erklärt. Was Guth und sein Ausstatter Christian Schmift auf die Bühne der Staatsoper bringen, ist wasserfest und durchweg idiotensicher. Vorzubereiten brauchte sich hier niemand, im Gegenteil, wenn die Walküren zu Beginn des dritten Akts auf Schlafsaalbetten herumgaloppieren, ist es sogar besser, den Text nicht zu genau zu kennen. Aber auch Generalmusikdirektorin Simone Young, die die Premiere musikalisch leitet, bekommt einige Buhs ab. Sogar schon zu Beginn des zweiten und dritten Akts. Daran liegt es vielleicht, dass ihr nach einem fulminanten ersten Akt so manches Thema arg in die Breite und sogar der eine oder andere Einsatz verlustig ging. Die Geschichte handelt – in aller Kürze – vom Scheitern eines germanischen Patriarchen: Wotan, der oberste Germanengott, sieht seine Allmacht vom Nibelungen Alberich bedroht. Der taucht in der “Walküre” zwar gar nicht auf, allerdings hatte er sich im “Rheingold”, dem einleitenden Teil der “Ring”-Tetralogie, einen Ring geschmiedet, der seinem Träger maßlose Macht verleiht. Wotan erpresste den Ring für sich, musste dann aber seine Burg Walhall damit finanzieren. Während der “Walküre” liegt der Ring in der Höhle des Riesen und Burgenbauers Fafner, der sich in einen Drachen verwandelt hatte. Fällt der Ring Alberich in die Finger, ists vorbei mit der Gottheit. Um ihn zurückzuholen, braucht Wotan – selbst kann er es nicht, weil er einen Vertrag mit dem Riesen schloss – die Hilfe eines freien Menschen. Die Konsequenz: Wotan geht fremd und zeugt Siegmund, dazu noch dessen Zwillingsschwester Sieglinde. Wotan arrangiert, dass sich die Geschwister verlieben – was seiner Frau Fricka, der Hüterin der Ehe, nicht passt. Sie fordert Siegmunds Tod, nicht zuletzt, weil auch die Existenz eines frei denkenden Menschen die Götter in ihrem Wesen bedroht. Wotan knickt ein. Er beauftragt seine Lieblingstochter, die Walküre Brünnhilde, Siegmund im Kampf gegen Sieglindes Gatten fallen zu lassen. Das wiederum gefällt Brünnhilde nicht: Aus Mitleid hält sie zu Siegmund, was diesem nichts bringt und dazu Wotan rasend macht – er verstößt Brünnhilde und ist damit schlussendlich über seine eigenen Füße gestolpert. Soweit die Situation. Die Aufgabe: Bitte einmal in vier Stunden erzählen, so schlüssig und spannend wie möglich. Guth schlug sich wacker: Er legt den ersten Akt, in dem Siegmund Sieglinde erst begegnet und sie schließlich, wenn auch nur musikalisch, beschläft, symbolisch auf einem überdimensionalen Leuchttisch an. An der Wand lehnt das Modell von Walhall in der Landschaft, das im “Rheingold” den Göttern noch vielsagend im Weg herum stand. Jetzt ist es eingemottet: Wotan hat sichtlich die Grenzen seiner Vision erkannt. Am Leuchttisch versucht er zu retten, was zu retten ist: Er lässt die Geschwister treffen und sich verlieben, lässt Siegmund das für ihn bestimmte Schwert finden. Dass hier jemand seine Finger im Spiel hat, bleibt dem Publikum für gewöhnlich verborgen. Diesmal nicht: Bei Guth taucht Wotan auch im ersten Akt höchstselbst auf, damit auch wirklich jeder kapiert, dass er gemeint ist, wenn die Hörner per Leitmotiv an ihn erinnern. Siegmunds Schwert bringt er gleich mit und rammt es es in den Haustürrahmen – damit es Siegmund theatralisch wieder herausziehen kann. Siegmund und Sieglinde als Kinder tauchen auch noch auf – könnte ja sein, dass jemand den Text wirklich nicht kennt. Brünnhildes Todesverkündung an Siegmund findet Ende des zweiten Akts schließlich unter dem Leuchttisch statt, der dritte spielt im Ausbildungslager der Walküren, einem heruntergewirtschafteten Saal mit durchgebrochener Decke. Kein schönes, aber ein stimmiges Bild: Während unten Wotans Töchter als graue Mäuschen herumturnen, stehen oben abwechselnd Brünnhilde, Sieglinde und zuletzt Wotan buchstäblich vor dem Abgrund. Den Walkürenritt als publikumsträchtigsten Teil der Oper choreografiert Guth als Nahkampftraining im Hühnerhaufen und spätestens jetzt wird sein Schicksal beim Schlussapplaus gewiss. Daran kann auch das Schlussbild mit echtem Feuer nichts ändern: Brünnhilde liegt schlafend im Feuerkreis, wartet auf einen Helden, der sich vor den Flammen nicht fürchtet. Würde nicht schon die Musik verraten, dass dieser Held der noch ungeborene Siegfried ist, müsste man meinen: Kann ja nicht lange dauern, bei diesen erbärmlichen Flämmchen. Der einzig echte Schwachpunkt: Die Standpauke Frickas an Wotan, die Schlüsselszene für alles, was sich im Weiteren auf der Bühne tut, driftet am Premierenabend ab in die Belanglosigkeit. Schade – der souverän agierende Wotan Falk Struckmanns würde sich von diesem bisschen Gekeife nie so aus der Fassung bringen lassen wie es das Libretto vorschreibt. Außer vielleicht am Premierenabend, da Struckmann sich eine Grippe eingefangen hatte und seine Partie nur spielen konnte. Für seine Stimme sprang kurzfristig der Hamburg-Debütant Thomas J. Mayer ein. Auch die eigentlich vorgesehene “Brünnhilde” Lisa Gasteen war indisponiert, weshalb die Brünnhilde-erprobte Deborah Polaski den Part routiniert übernahm. Keine Frage, dass es Polaski und Mayer sind, die das Publikum frenetisch feiert. Guth und Team kommen zum Schluss. Und holen sich die Buhs ab. Ohne dabei wirklich überrascht zu wirken. War ja klar. Simone Young und Claus Guth bescheren der Hamburgischen Staatsoper eine ambivalente “Walküre”. Siegmund, historisches Subjekt einer erhofften Welterlösung, trägt Parka und flüchtet vor Verfolgung und Gewitter in eine proletarische Resopal-Wohnküche mit Schrank, Tisch, zwei Stühlen, einem lehnenlosen Schemel, Spüle und Kochplatte und bekommt von der züchtigen Hausfrau Sieglinde eine Flasche Bier (“des seimigen Metes süßen Trank / mögst du mir nicht verschmähen”); Hausherr Hunding, der Siegmund später mit Wotans Hilfe besiegen wird, ist ein Underdog mit Heiner-Müller-Lederjacke. Regisseur Claus Guth und Ausstatter Christian Schmidt haben zwischen dem Ewigkeits-Pathos in Wagners “Walküre” und dem Bühnengeschehen eine beträchtliche Fallhöhe eingezogen, die als Resonanzraum einer gegenwartsbezogenen Deutung wirken soll. Das erotische Knistern bei der Wiederbegegnung der Wälsungen-Geschwister allerdings bleibt, wie manches in dieser Produktion, auf Wohnküchen-Niveau. Dass ein relevanter Teil des angestammten Wagner-Publikums so etwas nicht und ein mittlerweile ebenso relevanter Teil des Opernpublikums gar nichts anderes mehr sehen mag, gehört zum Konfliktpotenzial einer gegenwärtigen urbanen Opernpolitik, in dem die Staatsoper Hamburg zurzeit ihren Sowohl-als-auch-Platz zu suchen scheint. Ein ambivalentes Vorhaben mit ambivalenten Ergebnissen, wie schon im März beim “Rheingold”-Auftakt des bis 2010 laufenden Ring-Projekts. Guths Walküren-Interpretation folgt der These, dass die Sache mit der Welterlösung nicht gut gehen kann. Im ersten Aufzug zeigt er ein heillos in eigene Konflikte und Befindlichkeiten verstricktes historisches Subjekt auf einer künstlichen Spielfläche, die keinen Grund zur Hoffnung liefert. Im zweiten Akt spielt ein beziehungsunfähiger Wotan zunächst den Weltenlenker (auf dem Schreibtisch das Modell der Resopalküche, an der Wand die kleine Landschaft der “Walküre” wie ein Google-Earth-Relief), um sich zunehmend als kleinmütiger Gefangener von Sachzwängen in einer Welt aus “kann nicht”, “darf nicht” und “muss” einzurichten und skrupellos seine Lieblingstochter Brünnhilde zu opfern. So treibt alles auf den schrecklichen dritten Aufzug zu, in dem acht hospitalisierte Walküren einen in anstaltsgrau gekleideten ängstlich-nervösen Chor voller zwanghafter Gesten bilden; ansonsten ist hier alles überwuchert von trägem Schmerz, hohlem Fluch, langem Abschied und demütiger Einsicht in die historische Notwendigkeit. Das Feuer, das am Ende den Walkürenfelsen umflackert, wird die Welt auch nicht effektiver reinigen als das Gewitter am Anfang: Die Skepsis, die Guths Inszenierung prägt, ist durch historische Rückblicke gut belegbar. Im Detail weist allerdings die Ausführung des großen Gedankenbogens Schwächen auf, die seine Konturen verschieben, zerbröseln, verschwimmen lassen. Als Epizentrum dieser Schwächen erscheint mehrfach die musikalische Gestaltung durch die Philharmoniker Hamburg unter der Leitung der Opernchefin Simone Young. Manches klingt schlicht wie nicht ganz fertig geprobt, ausgerechnet in der Blechbläsersektion gibt es immer wieder Intonationsprobleme, und Simone Young tendiert dazu, die Tempi sehr auseinander zu ziehen. So entsteht zwischen stark forcierten und lang gedehnt nachhorchenden Passagen ein Eindruck eher von Heterogenität und Ratlosigkeit als von geschärfter Kontur und dramatischer Trägerschaft. Manchmal erscheinen Guths Regieeinfälle nur noch als Mittel, die langen Leerstellen, die die Musik mutwillig produziert, aufzufüllen. Dramatische Kulminationen wie die Todesverkündigung zum Ende des zweiten Aufzugs verschlummert das Orchester fast, klangmalerische Passagen wie das Einleitungsgewitter oder der populäre Walkürenritt dagegen sind fein ausgehört und in punktgenaue Klangbalance gebracht. Ein Premieren-Unglück entwickelte sich noch fast zum Glücksgriff: Wotan-Darsteller Falk Struckmanns Stimme war ein Opfer des Hamburger Herbstwetters geworden, so dass Struckmann nur spielte und der junge Bariton Thomas J. Mayer – der bereits vor drei Jahren in Karlsruhe den Wotan gegeben hat – vom Bühnenrand aus die Partie, von darstellerischen Aufgaben entlastet, überaus ausdrucksreich, präzise und textverständlich sang. Diese sängerische Leistung und vielleicht auch der mit ihr verbundene Verfremdungseffekt gehörte zu den musikalischen Stärken der Produktion, wie auch Yvonne Naef als Sieglinde, Deborah Polaski als Brünnhilde und der profiliert lyrisch intonierende Stuart Skelton als Siegmund. Ansonsten hinterließ das Ensemble einen zwiespältigen Eindruck, der das große Gebilde nicht ganz zu tragen vermochte. Was andererseits nicht schlecht zum bisherigen Gesamtbild der ersten “Ring”-Hälfte passt. Falk Struckmann who had catched an infection was mimicking the role of Wotan while Thomas J. Mayer was singing from the side.